Never Split the Party is an ultra social rogue-like game from Legend Studio. You’re one of four adventurers joining together to explore a procedurally generated dungeon, amass powerful upgrades, and cooperate with your fellow adventures to conquer and crush the evil dungeon champions. Your objective is to take down the evil vampire known only as The Countess, who killed your parents and is now constantly bombarding you with insults. Explore a procedurally generated dungeon, amass powerful upgrades, and cooperate with your fellow adventures to conquer and crush the vile dungeon bosses. 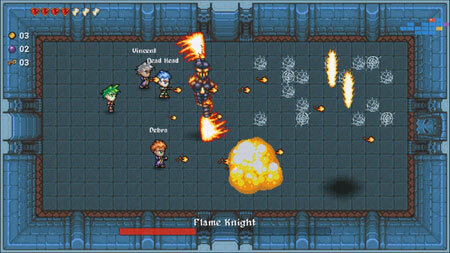 The game has over 120 upgrades, 21 magical potions, 28 unique enemies, and over 425 room designs spread among 5 procedurally generated dungeon levels for maximum replayability. If you get stuck in the game, check out the video walkthrough and gameplay for the game. This entry was posted in PC Games, Walkthrough and tagged Never Split the Party Cheats, Never Split the Party Game, Never Split the Party Gameplay, Never Split the Party Guide, Never Split the Party Hints, Never Split the Party Review, Never Split the Party Solutions, Never Split the Party Strategy, Never Split the Party Tips, Never Split the Party Walkthrough by Marvin. Bookmark the permalink.